This stange looking contraption is known as a radium ‘bomb’. Radium was a radioactive source used to give radiotherapy for cancer treatment in the 1930s at Westminster Hospital. The radium was placed in the egg-shaped lead-lined head (known as the ‘bomb’) and a bicycle break cable enabled doctors to expose patients to the radium by opening and closing the shutter at a distance – helping them to avoid exposure to the radiation. This ‘exo-skeleton’ leg frame was designed to relieve pressure on the joints of people with arthritis. It features an adapted bicycle seat to help the user to rest their weight when strapped into the frame. Perhaps our star object is the Stoke Mandeville Hospital bed cycle – which employed bike chain and cassette to help injured WW2 veterans rebuild strength in arms and lengths by pushing pedals. Stoke Mandeville Hospital was the site for the games that went on to become the Paralympics. Dr Ludwig Guttmann set up the specialist Spinal Injuries Unit in 1944 where the bed cycle was used. On the first day of the 1948 Summer Olympics in London, sixteen ex-servicemen took to the Hospital lawn in Aylesbury to compete in the first ever Stoke Mandeville Games. Credit: Science Museum). Cycling is clearly not just a recent passion. 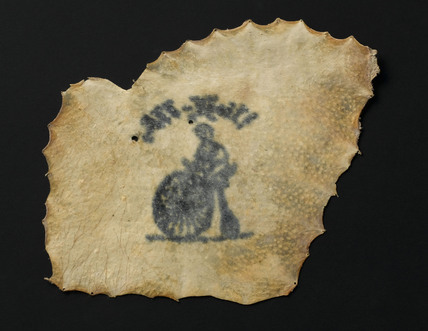 A number of tattoo’s in our collection, dating from around the 1890s show a great love for the sport. It would be interesting to know whether many of the GB Team have taken their passion for cycling as far inking the skin. Anyway – good luck to Wiggins and all the cyclists – let’s hope they strike gold! PS. Yay – Gold! Congratulations to Bradley Wiggins for winning the time trial. Ok so he wasn’t ever in danger of needing to break up his bike for hospital parts.